Wow, that week went quick. Had fun promoting Promises though, and I’m still experiencing a thrill each time I spot it in a store. A feeling I doubt will ever fade. Anyway, on to Friday Feast. This week’s recipe comes all the way from France. Literally. When I lived there I was lucky enough to attend a cooking school conducted by a very lovely lady named Tessa, which she ran from her house in Provence. My two friends – also Australian ex-pats – and I spent a couple of days with Tessa wandering the local produce markets before returning to her home to cook ourselves delicious three course lunches, which we then ate on her sundrenched patio and washed down with too much wine. Out of the recipes I collected from the school, perhaps even from my time in France, Tessa’s tepanade recipe is my favourite because it’s the most evocative. It’s a snack you’ll find in many bars and restaurants in the south, usually served with grissini or bread, and enjoyed with an aperitif. I adore making it in the summer, especially when the cicadas are singing. A glass of rose or kir royale in hand, Edith Piaf on the stereo, and I’m transported. Buy the best olives, anchovies and capers you can. It’ll make all the difference. Pound all the ingredients in a mortar and pestle until a chunky paste. Add pepper to taste. 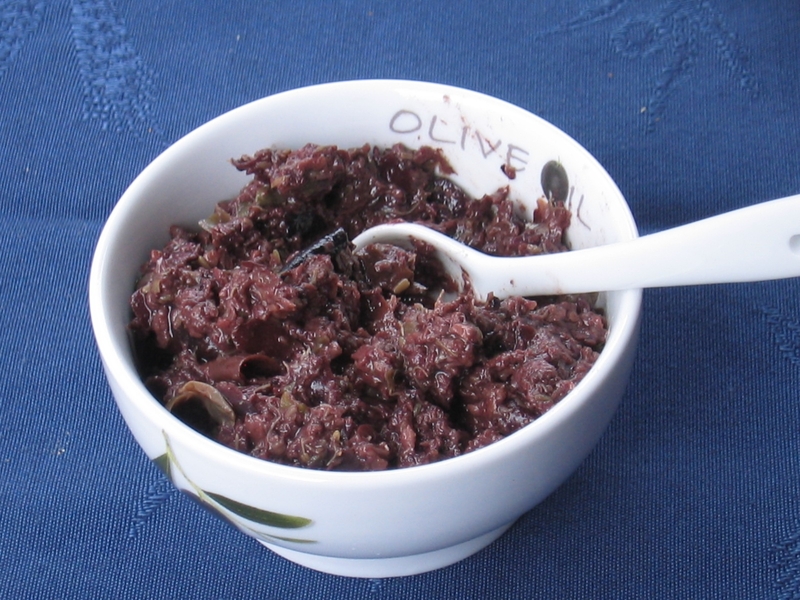 Tapenade can also be made in a food processor, but do not over process. Serve with grissini or some sliced baguette and enjoy. This entry was posted in Friday Feast and tagged Food, France, Friday Feast, Recipes on September 9, 2011 by cathrynhein. You’ll love this recipe, Fiona. It’s a beauty and guaranteed authentic!